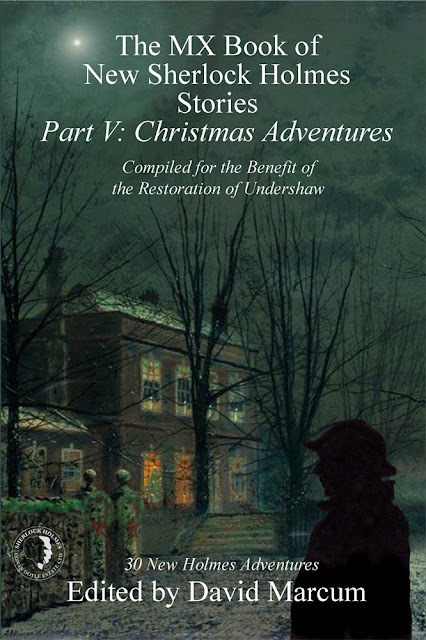 A Christmas-themed fifth volume in the ongoing series of new Holmes stories published by MX to benefit the restoration of Sir Arthur Conan Doyle's Undershaw. This is Volume V of the largest collection of new Sherlock Holmes stories ever created. “The MX Book of New Sherlock Holmes Stories - Part V: Christmas Adventures” features contributions by: Bob Byrne, Derrick Belanger, Amy Thomas, David Marcum, Denis O. Smith, C.H. Dye, Marcia Wilson, Julie McKuras, Sir Arthur Conan Doyle, Bert Coules, John Hall, Jim French, S.F. Bennett, Narrelle M. Harris, William Patrick Maynard, Vincent W. Wright, James Lovegrove, Arthur Hall, Nicholas Utechin, Mike Chinn, Tracy J. Revels, Roger Riccard, Wendy C. Fries, Paul D. Gilbert, Jan Edwards, Molly Carr, S. Subramanian, Peter K. Andersson, Matthew J. Elliott, Hugh Ashton, and Mark Mower, with a poem by Ashley D. Polasek and forewords by Jonathan Kellerman, Roger Johnson, Steve Emecz, Melissa Farnham, and David Marcum.